Jon and I moved into our home almost four years ago - I can't believe it has been that long! We have done so much work that I don't think the original owners would recognize this place. When we moved in, almost every room was pink, including the kitchen. Pink cabinets, pink counters, pink tile back splash, and pink walls. They even had a pink kitchen table... We immediately changed the walls which helped, but only a bit. 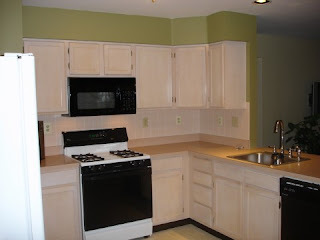 Finally, about a year after living with the kitchen while we did other projects, we decided to remodel the kitchen. 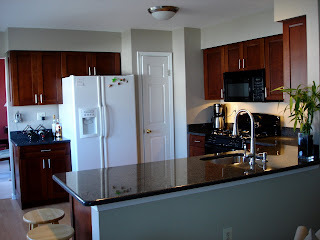 When we remodeled we had gray Formica counter tops put in - I don't know why we made that decision - but just last week we had granite counter tops installed. 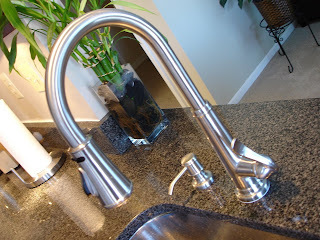 Jon also put in a new faucet and garbage disposal after the install as well as a new dishwasher a few months ago (he's so good!). 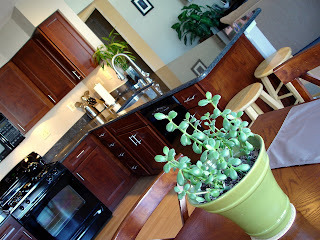 Here are some pictures of where I spend so much time cooking and creating everything you see in this blog. Just one thing left to do - change the fridge from white to black. Eventually we'll move to a larger home and I already have a huge wish list for our next kitchen. But for now I love this room in our first home together, and that makes cooking even more enjoyable for me than it already is. Oh it's so pretty, and it looks really efficient too. Lucky you! Wow, what a transformation. It seriously looks amazing! I would never leave my kitchen if it looked so pretty! 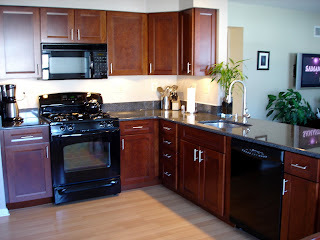 The old kitchen did not look horrible, but the remodeled one is stunning!! Great job. oh my gosh i wouldn't even know it was the same room! incredible!